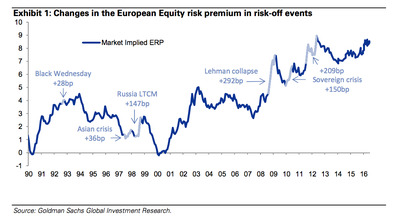 Britain leaving the European Union would have a strong negative on European equity markets, but the impact would be nowhere near as bad as the fallout following the collapse of Lehman Brothers in 2008, according to Goldman Sachs. In a recent note sent to clients by Goldman analysts led by Sharon Bell, the bank argues that European stocks could tumble as much as 15% in the event of a Brexit. That’s a pretty massive fall, but less than a third of the 46% fall seen in the Stoxx 600 broad index of European companies after Lehman went under. “Exhibit 1 puts in perspective moves in the pan-European ERP1 following major shocks since the 1990s. During the European sovereign crises, the ERP rose by more than 200bp before receding following ECB president Mario Draghi’s ‘Whatever it takes’ speech in July 2012. During the Lehman Brothers crisis, the ERP rose almost 300bp on our estimates. 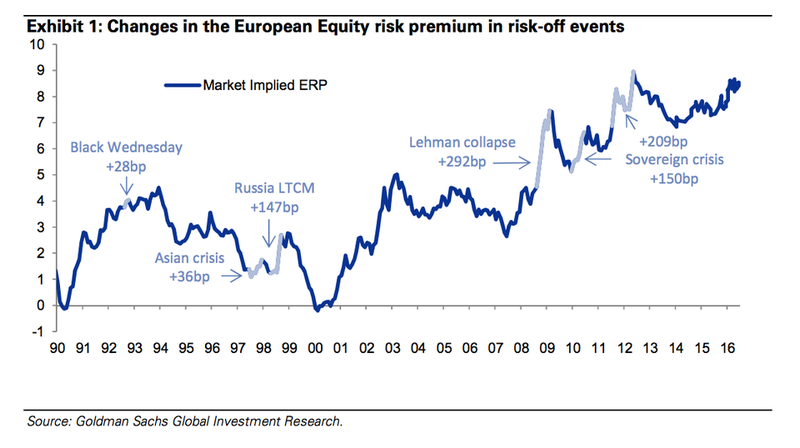 Exhibit 2 summarises these previous risk events, the rise in the ERP, and the impact on stock markets. The Lehman Brothers collapse provides an upper limit in our view and not one we think is an appropriate benchmark of comparison for Brexit. Stocks that would be most affected, Goldman argues, are those that make up the bank’s UK Domestic Exposure Basket — basically companies with the highest exposures to the UK market. The companies in the basket include the likes of Lloyds Bank, ITV, supermarket chain Sainsbury’s, and high street stalwart Next. Many of the companies Goldman says would be hit hardest reflect those cited by Macquarie analysts as the biggest losers after a Brexit. Barclays analysts warned earlier in the week that the global economy is approaching a Lehman Brothers style event, but whatever it is, it won’t be Brexit.